The S/Y Palau Siren was constructed, like her sister ships, by Worldwide Dive and Sail‘s team of master yacht builders in Sulawesi, Indonesia. All the small touches and comforts of our Siren Fleet liveaboard yachts have been included, coupled with new design features and interior decoration to reflect the style of the Palauans. Equipment rental, Marine Park & Port Fees, gases and courses can now be pre-booked and pre-paid at the time of booking. The 40 metre S/Y Palau Siren refined liveaboard launched in July 2012 to offer year-round diving trips in Palau. Built with the same specifications as her sister yachts, the S/Y Philippine Siren and the S/Y Indo Siren, the cabins are either fixed double or twin bed, however we offer flexibility with 2 cabins which can be converted from twin to double to suit the needs of our guests. The dining area is very spacious offering a great setting for all your meals. The dive deck is perhaps the most spacious and comfortable you would have experienced. The Palau Siren has designated indoor and outdoor workstations for charging, preparation and maintenance of your camera and video equipment. Large storage drawers for your peripheral items are available, as well as numerous charging points, with adapters available (sockets are 2-pin European style at 220v or 110v) Naturally, we also have large rinse tanks with fresh water solely for camera and video equipment – this beautiful liveaboard vessel truly sets out to be the pros choice for underwater photography and videography. Essential dive equipment of Aqua Lung Wave BCD, Calypso regulator, 3mm shorty wetsuit, mask & fins. * 12l aluminium tank & weights. SMB (safety sausage). For all certified Nitrox divers we offer free, unlimited nitrox refills for the duration of your trip. This includes all meals, snacks & refreshments such as coffee, tea, herbal tea, fresh water, carbonated soft drinks, fruit juice, fresh fruit & cookies. Local transfers to/from the yacht to/from the local airport. NOTE: Optional extras and Marine Park & Port fees for cruises in Palau are quoted in USD and will be added to your final cruise invoice in advance of your cruise. Alternatively, it can be paid on board the Palau Siren. We accept cash payment in USD, EUR, GBP, and AUD, as well as all major credit card (except American Express). All credit card transactions will be billed in US$ dependent on the exchange rate at the time of your trip and an admin fee of 3.5% will be applied. Worldwide Dive and Sail considers the safety of our guests and crew the preeminent issue aboard our yachts. The S/Y Palau Siren has been constructed to the highest standards using top-graded materials. She is equipped with the latest safety features including Automated Life Rafts, Life Jackets, Fire Extinguishers, Smoke Alarms, Emergency Long Distance Radio, Satellite Phones and EPIRB. 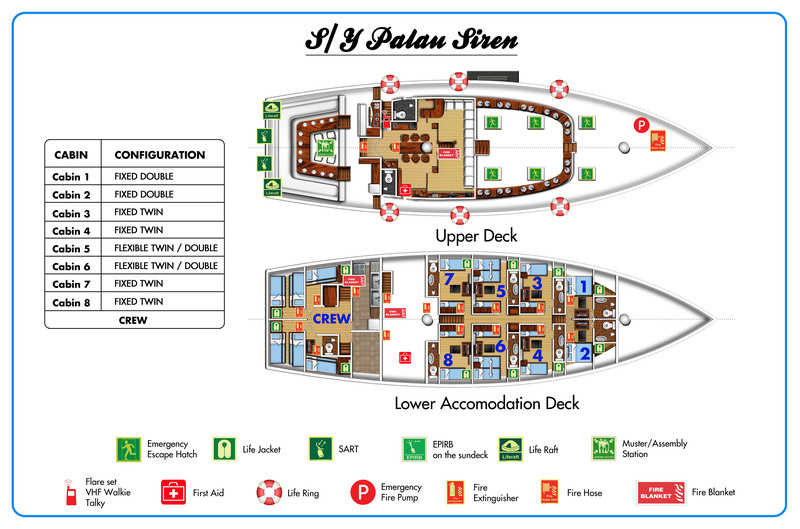 Each crew member of the S/Y Palu Siren has received extensive training in all aspects of safety, emergency management and evacuation procedures. Our crew keep their skills fresh and up to date with regular practice drills. The dive team are all emergency medical responders and on board you will find a fully stocked medical box for treating minor ailments and injuries, along with a full supply of medical grade oxygen and DAN Oxygen provider kits. Upon boarding, guests will be requested to try out life jackets and briefed on emergency procedures by our cruise director. All guests should ensure they have adequate dive and travel insurance from a reputable supplier such as DAN or ask our team about DiveAssure. Aboard the S/Y Palu Siren you can be confident in our ability to provide care and safety of the highest standards. The trip is made by the enthusiasm and passion for excellent customer service as shown by every member of the boat team. The crew definitely made the trip a world class experience. I would say their service really made this vacation special and they all really did a great job keeping the cruise going and everything running smoothly. Kailey was an excellent dive master and instructor. I’ve had some great course instructors in the past and she was still much better them. Great thanks to Ulu who did an awesome job driving the skiff around the islands to the dive site. I really enjoyed the post dive rides back to the Palau Siren through the little passageways between the islands. Ann also did an excellent job taking care of us before and after the dive with Estrella. Ann and Roxy were friendly and very helpful. My cabin was clean as was the entire ship I found the crew very efficient and organized. Kaine, our boat driver, was very helpful getting on and off the boat and all the equipment was always ready to go for every Dive. Sebastian and Pep were the best and made me feel safe and secure every dive. Your support staff kept everything running smoothly. I hope to dive with Siren fleet in the future. Thank you for a wonderful trip. The entire crew was absolutely amazing. They made sure that our every need was taken care of, and they were so nice. Anne learned all of our names within a day, and Roxy was always so helpful. Kane and Ulu were fantastic skiff drivers, taking us on little tours by the islands on the way to and from the dive sites, and doing a great job helping us with everything we needed. I cannot say enough about how fantastic the entire crew was. The staff was fabulously welcoming and pleasant and didn’t seem fake they are all real and wonderful. The boat is fabulously appointed and many extras. Outlets all over make it easy to plug in computer for photos anywhere. Warm water showers readily available was so great.The dive crew was over the top awesome. Can’t believe how good and varied the food was. They were very competent and I never felt like they were annoyed with my questions or challenges. They were always happy to help me. The food was amazing ! Michael and Edison did an amazing job with all of the meals. I found myself always looking forward to the meals! It was truly amazing and the staff was the nicest crew I’ve ever met. I would recommend this liveaboard to anyone who’s interested. The whole crew were brilliant, really brilliant. Pep was absolutely outstanding in every respect. We would go on trips if we knew he was leading them. Ann was also particularly outstanding. To be honest it seems almost unfair to highlight any individuals as they were all so good and we had nothing but great experiences with all of them.